Hi! As it's Thursday again it's Georgina here with my regular Thursday post. 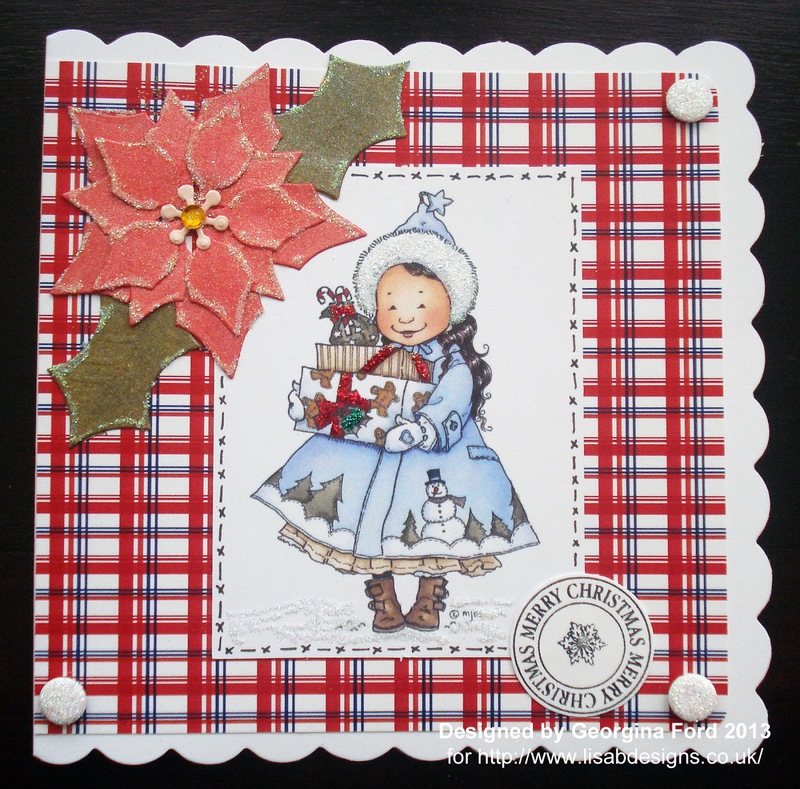 I have a Christmas card to share with you today using a cute topper from the Hobby House Eskimo Kisses topper sheet available from Lisa B. Designs. 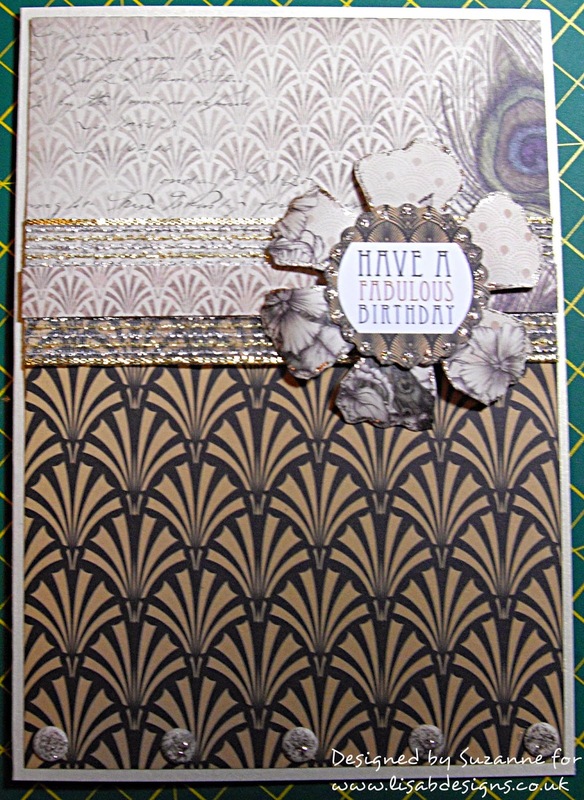 To make this card, I cut a panel 13.5 x 14cm of Sailor Check patterned paper. 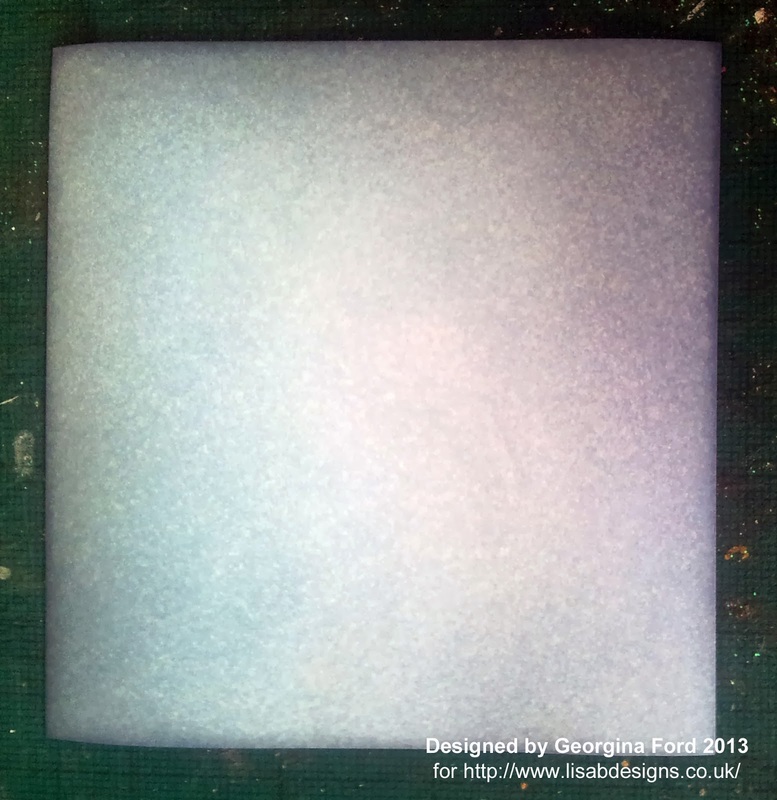 I rounded the two right hand corners with a punch before adding it to a 14.8 x 14.8cm scallop edge card blank. 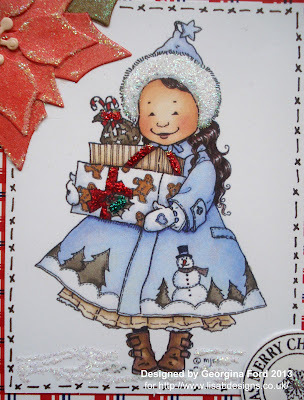 I chose the sweet little girl topper for my card. I attached the topper to the card and added faux stitching around the edge with a black fineliner. 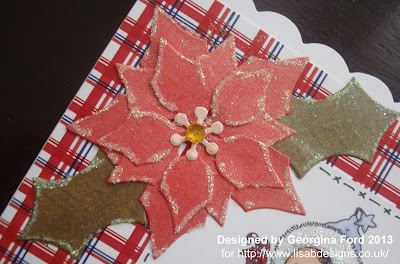 To create the flower I used Xmas Flower cutting and embossing dies. The card I used to cut the flower and leaves from was the pink card sheets from the Pastel mixed double-sided premium pearlescent card. 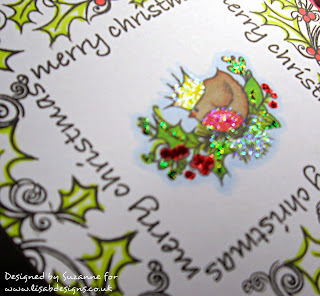 I coloured the card with Darn Boor and Forest Moss Distress Ink pads. I added the ink with a Blending Tool. I added the flower to the card and then added a gold gem to the centre. I added glitter to the edges of the flower. I added white Card Candi to the corners of the card. I then added glitter to the Candi. The circle sentiment is from Hobby Art's Winter Wishes stamp set. 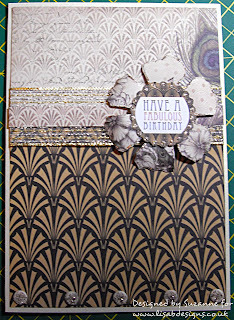 I stamped this with Tuxedo Black Memento ink pad. 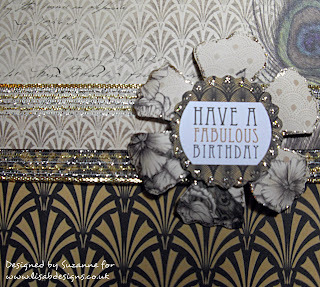 To finish the card I added various coloured Stickles and glitter. It's a wee bit wet out there today, it looks so miserable......roll on summer!! WellI hope you like the inspiration, I will be bringing more Vogue projects to you along with my Design Team. Hello crafters, Kirsten here, happy Tuesday. This idea came to me because I didn’t have a suitable embossing folder & I wondered if die cuts would give a similar effect. 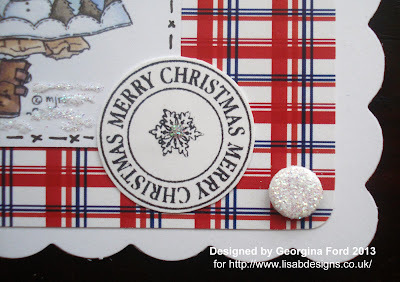 I used the Joy Craft Ice crystal die to cut the snowflakes & glued the pieces to the base card with Cosmic Shimmer glue, then trimmed off the edges. I think it worked quite well. 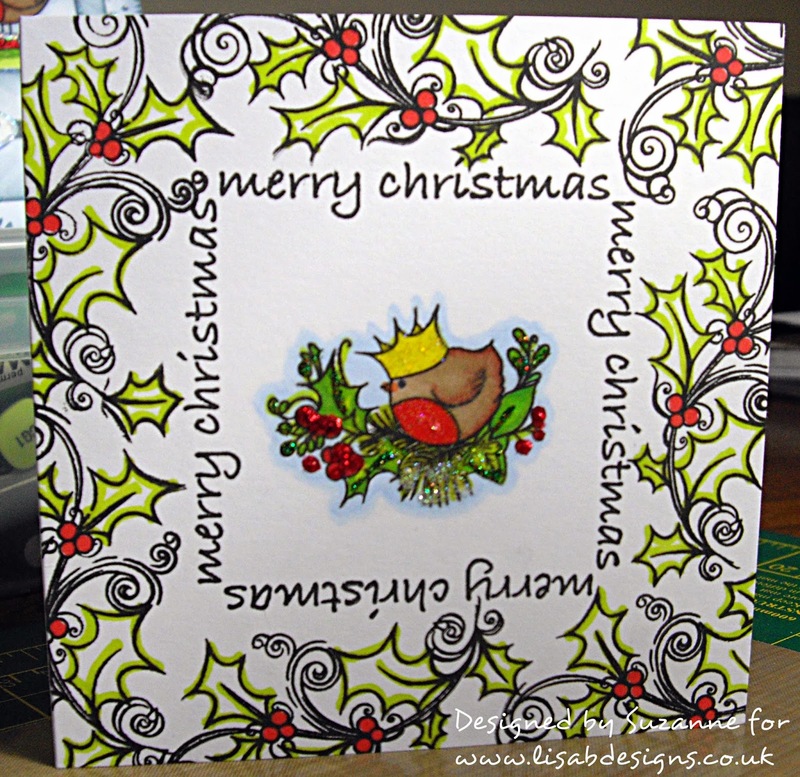 Handy hint; if you’ve chosen to use a white background, use the same card for your die cuts & base layer. It’s amazing how many different shades of white there are. Next I wondered if you could achieve a letterpress effect. I covered the base card with Memento London Fog ink, applied with a blender. Obviously you can use any colour card, but if you choose to use ink, make sure it’s a permanent one. If you use something like Distress ink, the wet glue will cause it to run & you won’t the letterpress effect. No before photo I’m afraid, but again, I think it worked. On both cards, I coloured the Hobby Art Winter Robin with watercolour pencils, as per my blog post from last Tuesday & added white liquid pearls as an extra embellishment. That’s it for now. 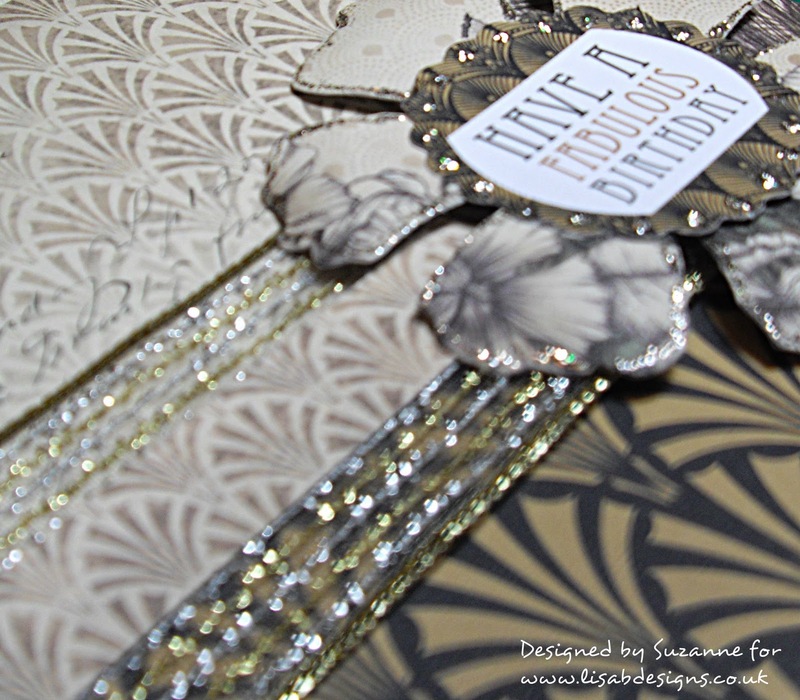 Don’t forget the blog challenge, there’s still a few days to go. See you next time, happy crafting. What a miserable day out there, I hate winter!!! 21, Froyle Close, Allington, Maidstone, Kent. ME16 0RQ. Anyone is welcome between these times....we have a Waitrose just across the road from us, so if you are able to walk OK, can I ask that some of you park there and walk across so that we don't block the close up too much!! There are THOUSANDS of items to clear out and I mean THOUSANDS!!! A lot of the items are new or nearly new only having been used once or twice, some of the paper pads may have odd papers missing........everything is SOLD as SEEN and this will be a CASH ONLY SALE. The odd cheque may be accepted if you are BULK BUYING?? There is a cash point in Waitrose if you need to get any cash out! Hi it's Georgina with my regular Thursday post. Today I have a Christmas card to share with you which I made with the cute Woodware Clear Magic Christmas Hoot stamp available from Lisa B. Designs. This stamp would make an ideal Christmas card for a football fan as the hat and scarf can be coloured in their team colours. 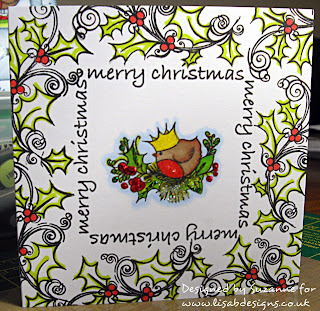 To make this card I started my cutting a 90x90mm square of white card. I coloured it with Stormy Sky and Tumbled Glass Distress Ink pads. I used a Blending Tool to add and blend the colours. 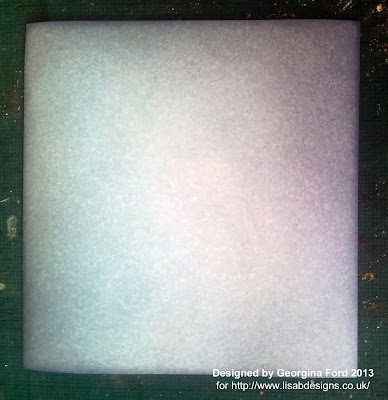 I mounted this onto a 100x100mm square of dark blue card. I stamped the Owl stamp with Tuxedo Black Memento ink pad onto smooth white card. I coloured the image with Copics. 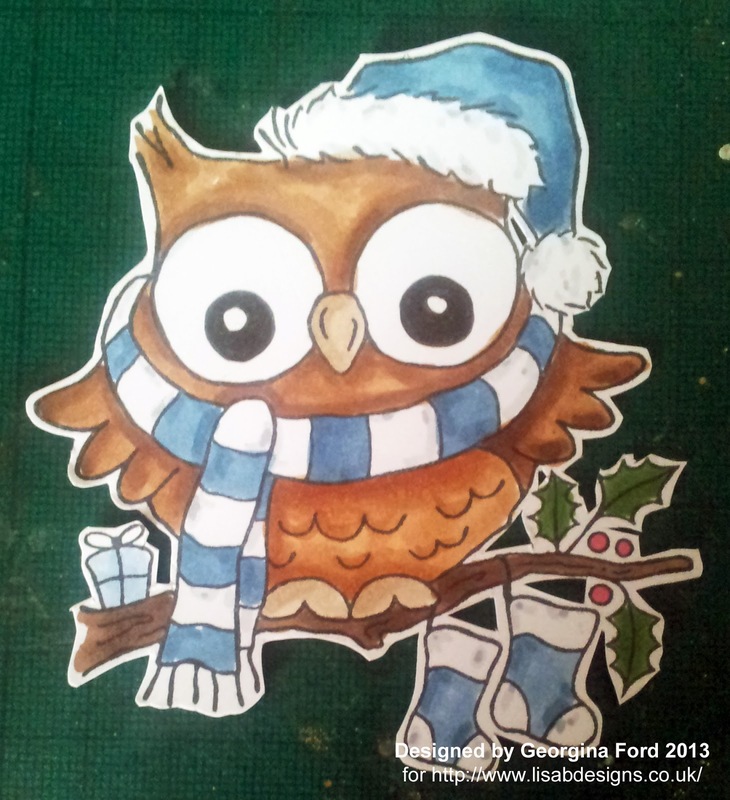 Once coloured I cut around the owl as shown below. 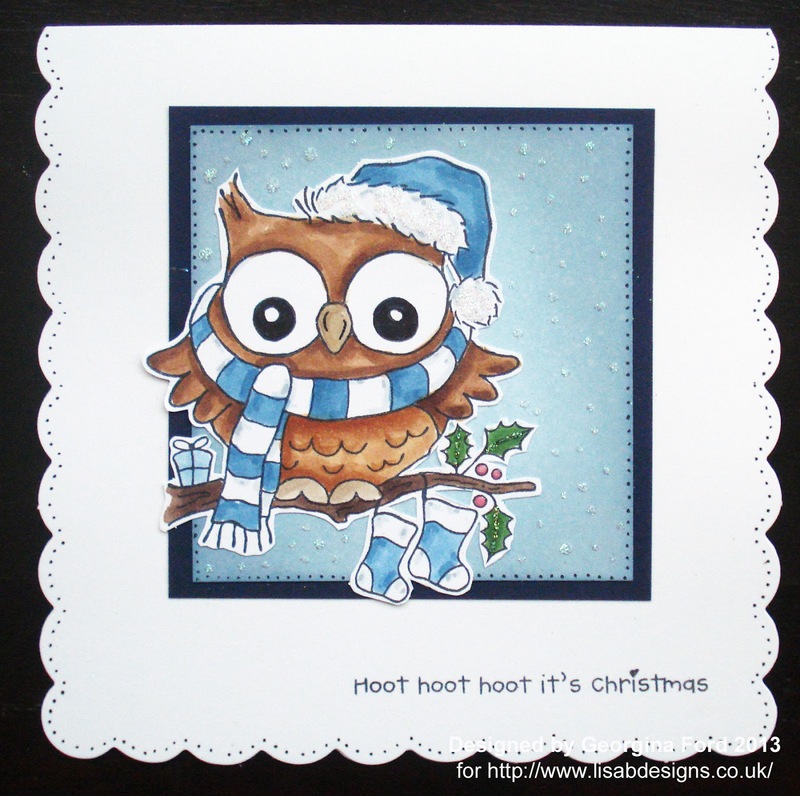 I attached the square and owl onto a 148x148mm Scallop Edge card blank. 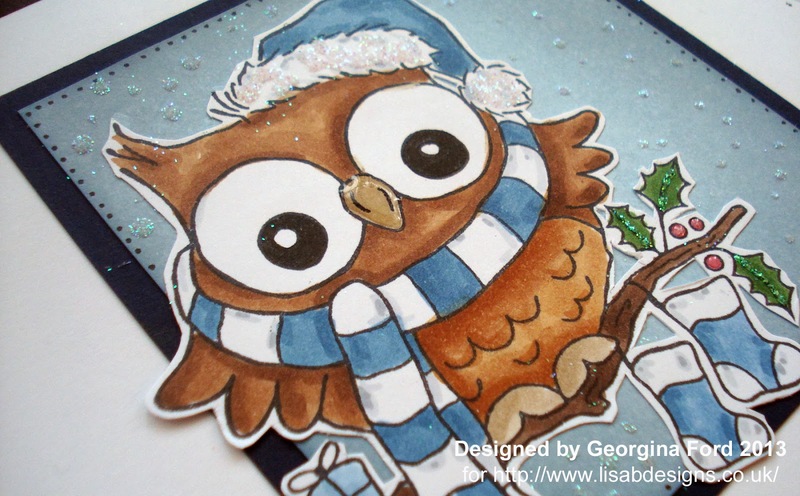 I stamped the 'Hoot, Hoot' sentiment with the Memento ink pad onto the bottom right corner of the card. I added black dots around the blue card and the edge of the cards with a black fineliner. 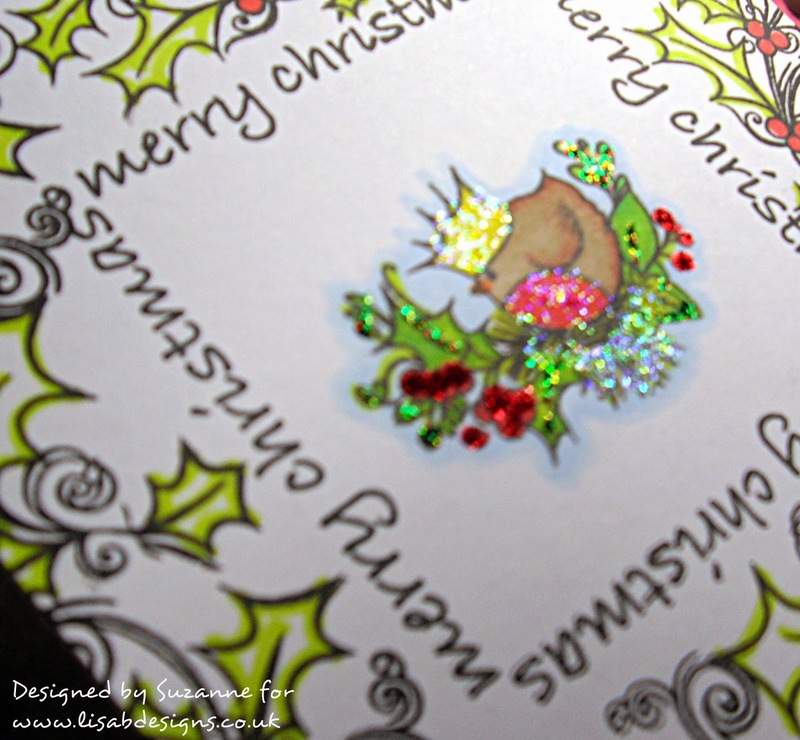 To finish the card I added Glossy Accents to the holly berries and glitter to the sky and holly leaves.